I've only read the first book and listened to the rest of the series on audio. I've seen all the movies to date and I don't consider myself a fan, I do enjoy the series. 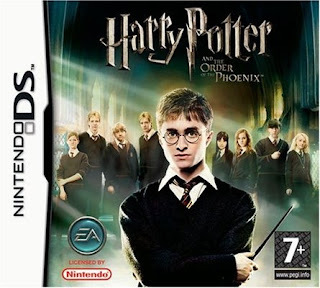 I've only ever played one other game in this franchise, and that was the Goblet of Fire for the PS2. It was quite fun, but overall, these games based off the series don't really interest me. But I wanted something to play on the DS without having to buy a new game, and Seth has a small kiddy selection. So this is what I choose to play next. The game itself, plot and what I have to do...well, its like the movie that its based off. There's nothing new revealed, no new side story that was was hinted in the movies or books. Its a copy of the movie, so there are no surprises. Which makes the game story, quite boring. But if the game play is fun, then it doesn't' matter that we all know the story. But alas, this is not the case here. 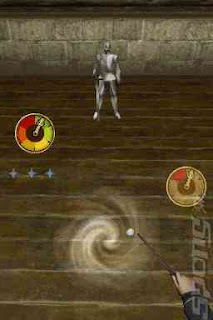 The game play, is using the directional pad to walk around, and you use the stylist to make swishes with the wand to cast spells, followed by a little mini game to complete the spell. And its the same 8-10 mini games over and over again. There are maybe half a dozen mini games that you play once and never see again. That helps to keep things a little bit interesting. But saying that is like staring at those 3D pics where you have to see a picture in it, and just when you think are you seeing something and you get a little excited, your eyes adjust and you see static again. Having a little tiny weeny little ray of sunshine in a shitblock, doesn't make up for the downright boring game play. Well, one could think, theres more to it than casting spells, theres levels and interacting with the HP characters. Even that is boring. 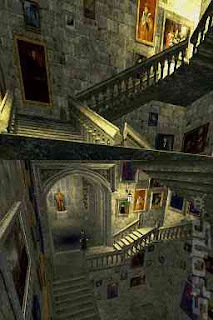 you start out in your dormitory, and the designers of the game must have thought it was cool to really design Hogwarts and have people walk all over it in real time. So in the game it tells you to go to the courtyard and see so and so. So you walk down the 10 flights of stairs and through the hallways, across the walkways, through the doors, etc, etc,. It really feels like they wanted the player to FEEL like they were walking around Hogwarts. So getting to your destination is very tedious. Go here, talk to this guy, go back there and talk with that guy, run into Malfoy and have a wizard duel, make your way back to your room, talk to Ron, practice your magic, go to this room, go to that room. Over and Over, this is the formula that the game follows. It is nothing but a walk and gather game. But with nothing to do in between to keep it interesting. It would be the same thing if they had Grand Theft Auto , but you could only run on the road and there was nothing you could interact with and the object of the game was to run across town to talk to Jimmy Badass then walk back home to see who is the next person to talk too. The game is really tedious, the same things over and over, and besides that. The character, Harry, could get stuck on objects that you can't even see. You go through a door, but he wouldn't go through, it was like the game wasn't reading the sprite going through the door. So I back up and do it again and again. Until eventually I would make it through the door way, but doing nothing different than what I was doing all along. I was wondering if you needed to be a Harry Potter fan to like these games. 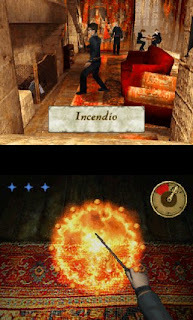 I enjoyed the Goblet of fire game, so I don't think its a bias thing. But this game was downright boring. There was nothing to do in it, what was there, was so little and far in between. The only people that I think would enjoy this , would be young fans who get a kick outta , "look mom, I am walking through Hogwarts, here's the door that they talk about in the movie". Wow, this is a case where the trailer for this thing is far better than the actual game. Don't be fooled, its still boring. Don't believe me, watch the Majhong trailer, I'm worked up for a good ole game of Majhong now!!! !